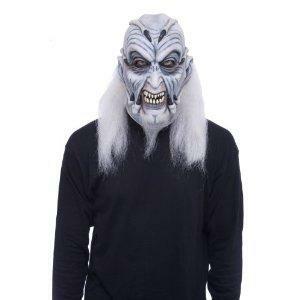 If you are looking for a costume to give everyone a fright, consider a Jeepers Creepers costume. Even if you have not seen the 2001 movie Jeepers Creepers, you may recognize the Creeper with his menacing eyes, greenish gray skin, dark scarecrow trench coat, and freaky hat at Halloween or a party. The original Jeepers Creepers movie came out in 2001, with a sequel in 2003. The movie is considered a 'sleeper' hit as more and more teens discover that it has a cult following and will want to see both the original and the sequel. In addition, many teens and adults are finding the costume is still very popular and super scary to wear at Halloween or parties. According to the website Shock Till You Drop, a new Jeepers Creepers sequel is slated for release. You can be sure that all cult moviegoers will be wearing a Jeepers Creepers outfit on the opening night of the third sequel. The Creeper is a humanoid fish or bat like creature that comes out of hibernation every 23 years to feast on human flesh for 23 days. In the opening scene of the movie the Creeper is a scarecrow hanging on his pole, he suddenly jumps off the pole and flies at an adolescent boy and devours him as his father watches. The Creeper targets groups of teenagers for his feast as he infiltrates their unsuspecting communities. The body of the Creeper is in the shape of a man with greenish gray leathery or scaly skin. He has huge bat like wings that he unfolds when he needs to jump or fly. The bald head of the Creeper is adorned with horns and wispy hair at the nape of the neck. His face has hard ridges above his eyes and is well hidden in his hat when he is trying to go unnoticed. If you ever see his beady little eyes and his head without the hat, you are probably one of his 23 human meals! To look like the authentic Creeper, you really need a professionally made mask. Jeepers Creepers masks are not cheap. An authentic looking mask may be as much as $100. MGM film studio has only licensed a few companies to reproduce and distribute the mask and hats. If you are planning on keeping your face well hidden under a floppy hat and collared trench coat, you can get away with applying your own makeup and not wearing an authentic mask. Use face putty to build up ridges above your eyes and on your cheekbones. Apply thick green or gray make up over your face. The easiest Jeepers Creepers clothing will consist of regular human clothing. Your Creepers mask probably came with a hat, if it did not try to locate a black or brown floppy leather or canvas hat that is similar to an Indiana Jones hat. The Creeper wears regular pants and shirt with boots. He covers his clothing with a long brownish black trench coat that is somewhat shredded at the bottom. Lift the collar of the trench coat to hide the sides of your face and neck. Throughout the movie you will notice that his hands are covered with gloves. Any type of gloves will do especially if they are dark like the trench coat. If you invest in a Jeepers Creepers costume, the re-sale value may still be high on websites such as e-Bay or Craigslist. As a matter of fact, you may want to checkout e-Bay and Craigslist first to see if you can buy a used Jeepers Creepers mask before buying a new one.